This is a good news/bad news story (at least for me). 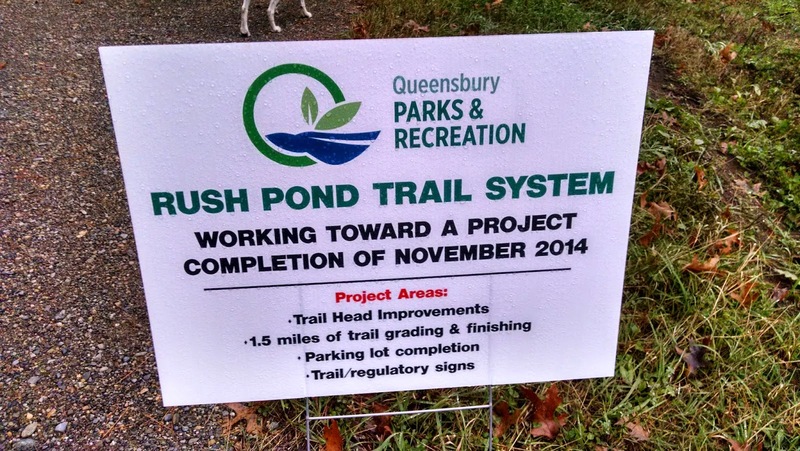 I had read last year that Queensbury Parks and Rec was in the process of creating another recreation area for town residents and visitors to use. Fantastic I thought! 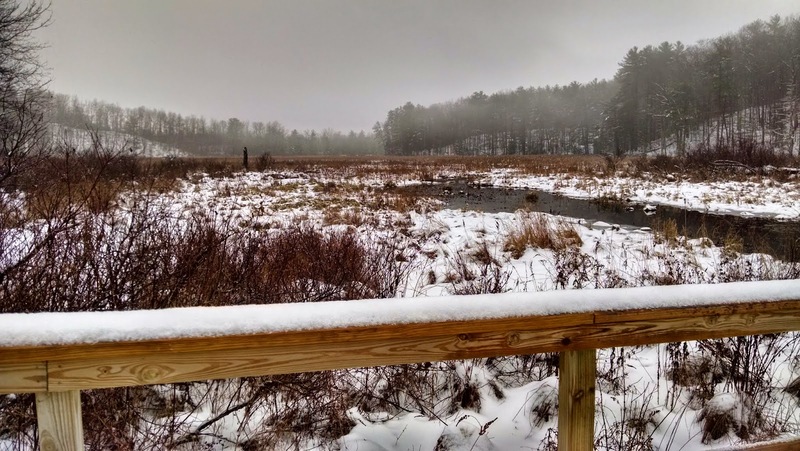 The Rush Pond area lies just west of I87 Exit 20 and just west of the Great Escape amusement park. It would be a 5 minute drive for me to get there. 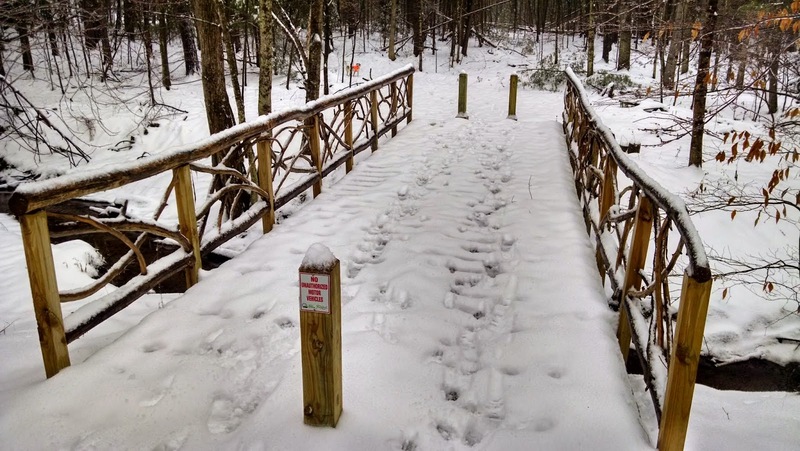 This past summer, myself and other town residents, began to explore the area where the new trail was being created. 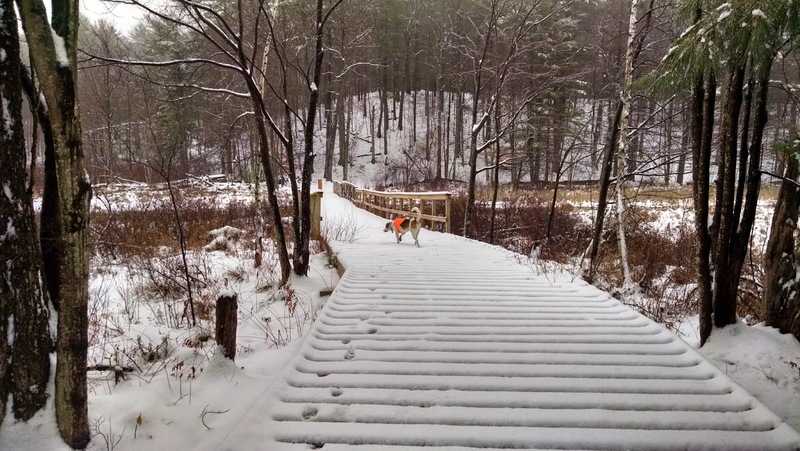 The trail follows an old jeep road for its entire length. 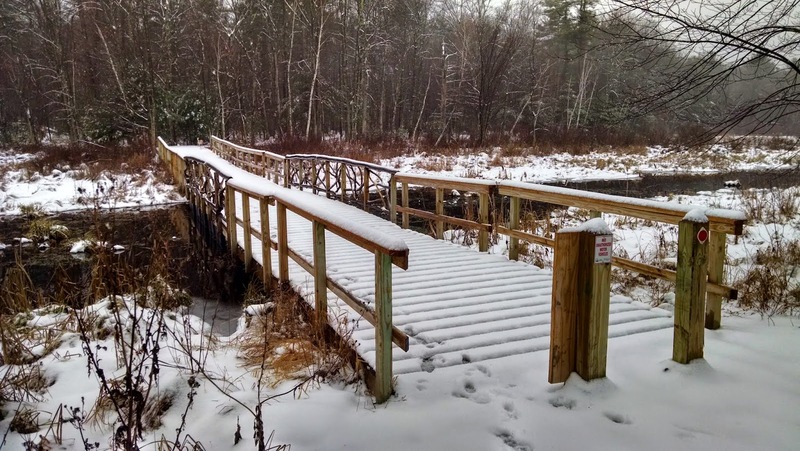 The town built 3 nice new bridges at the 3 water crossings that are encountered. This area became my go-to place to go for a walk with my dog Rev when we only had a short time to walk (such as evenings after work). 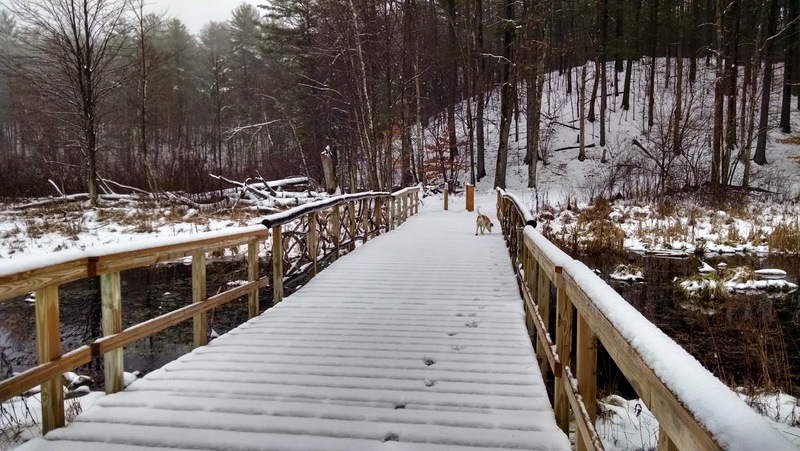 As we moved into fall, and it started to become dark early, the Rush Pond area became an easy place to walk with a headlamp and get Rev out for some exercise. 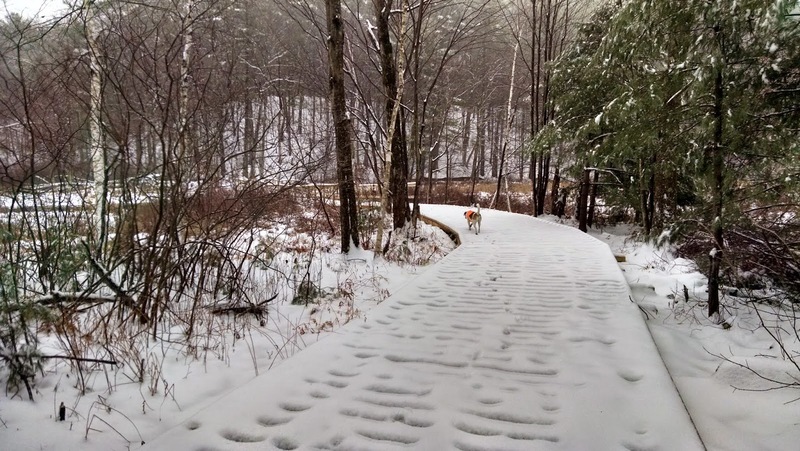 The jeep trail is nice and smooth and easy to walk on. There are very few places I know of where I can easily walk the dog at night. 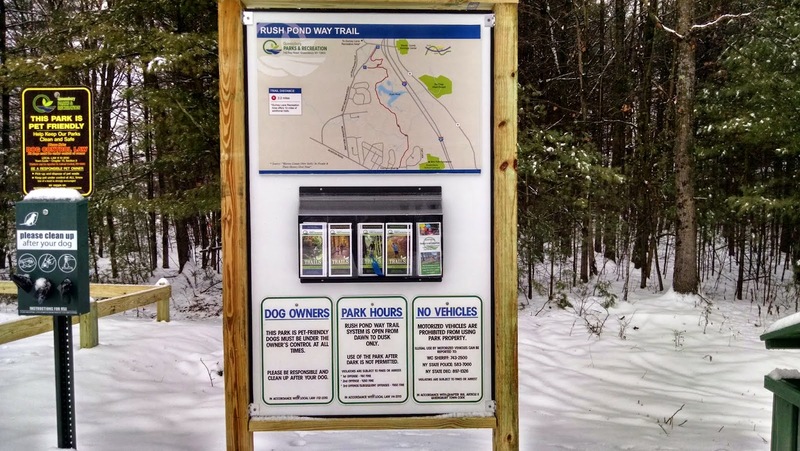 Unfortunately, as the trail system neared completion, Parks and Rec added another sign below the main sign saying the trail is open during daylight hours only. I showed up on Monday night, December 1st to take my nighttime walk with the dog and saw this sign. I was crushed! Parks and Rec also placed a kiosk with a map of the park, a brochure rack, and some additional rules of the park. They made a point of stating that persons using the park after dark are subject to fines and /or arrest. They even display a monetary fine structure: $50 1st offence; $250 2nd offence, $950 3rd offence! I was shocked! 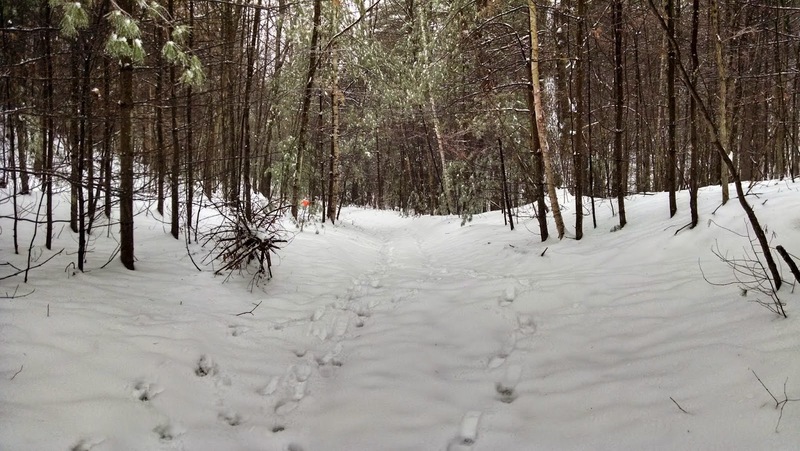 I had already been looking forward to XC skiing the trail system at night. It would have been great under a full moon. :( I was incredibly disheartened. Rev and I turned around and went home. 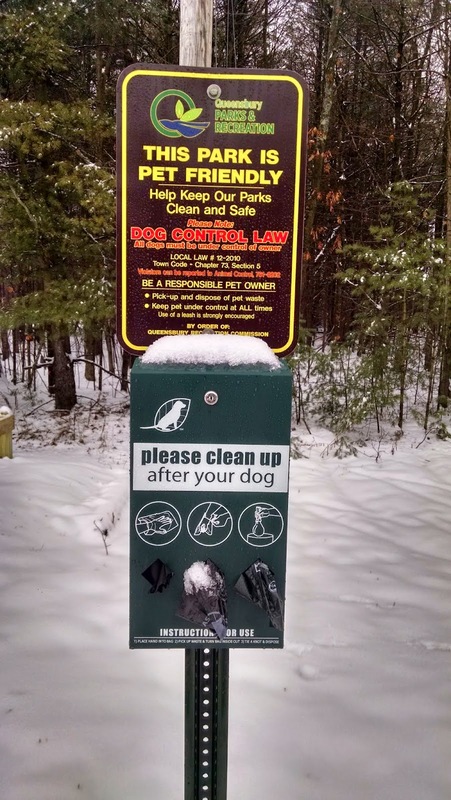 Amazingly Parks and Rec did not institute a leash requirement, but rather said that all dogs must be under the owners control and they highly encouraged the use of a leash. I use a remote collar on Rev and always leash her when people are coming towards me (unless they have a dog off leash). Rev does much better approaching other dogs if all dogs are off leash. If the other dogs are leashed, I leash Rev and keep the dogs apart. Anyway, today (Wednesday), I had the day off from work. 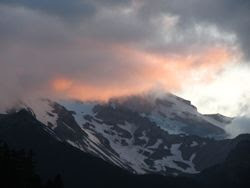 We had received 3" of new snow overnight, but in the morning it was in the mid 30's and drizzling. 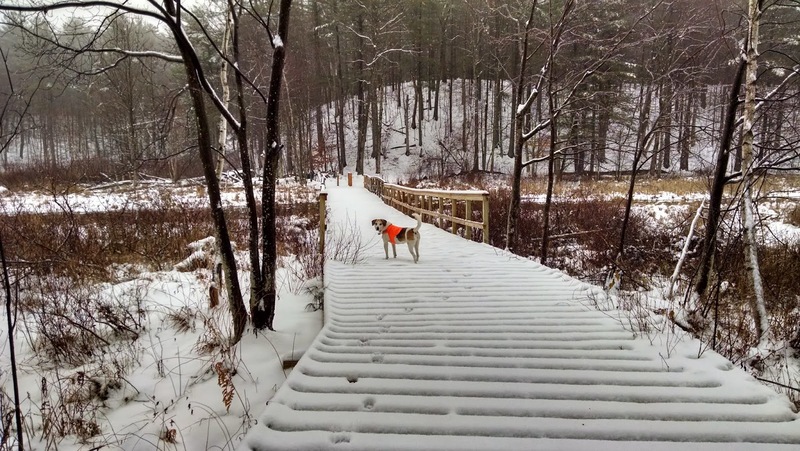 I didn't feel like doing a big hike, so Rev and I did the Rush Pond trail. 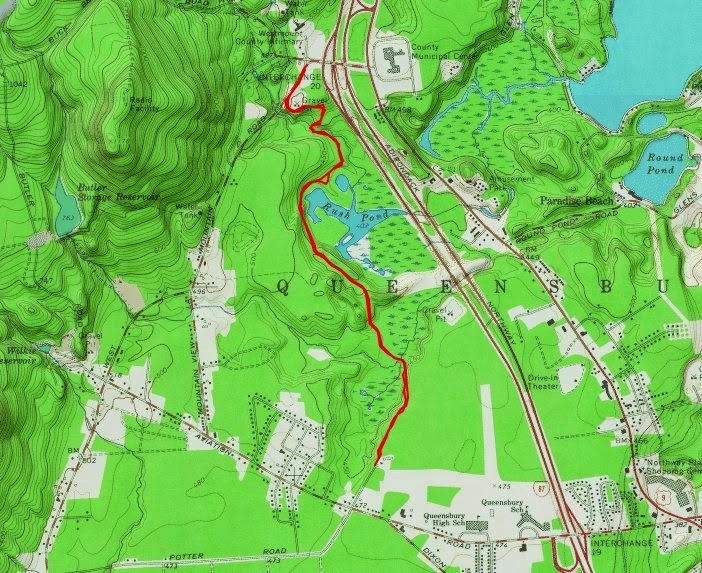 It is about 4.8 miles out and back if you do the full trail. When we were headed in, we saw 2 women coming out (with 3 unleashed dogs). The dogs all did their visit, and then Rev and I moved on. 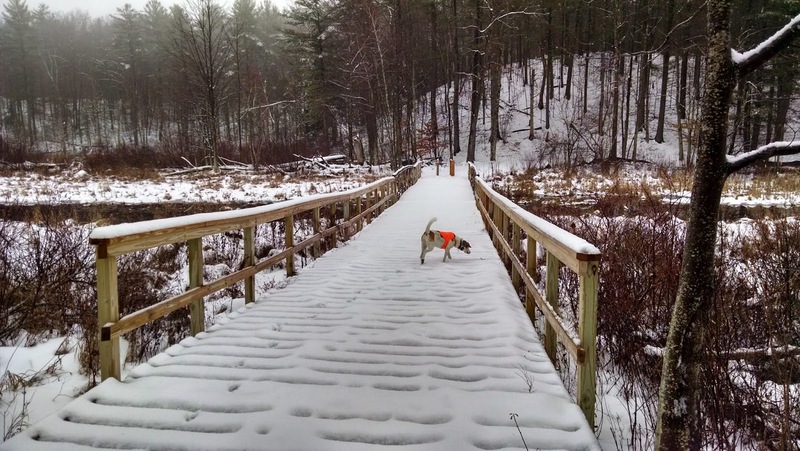 The full trail (down and back) takes about 1.5 hours at a brisk pace, or 2 hours at a normal walk pace. 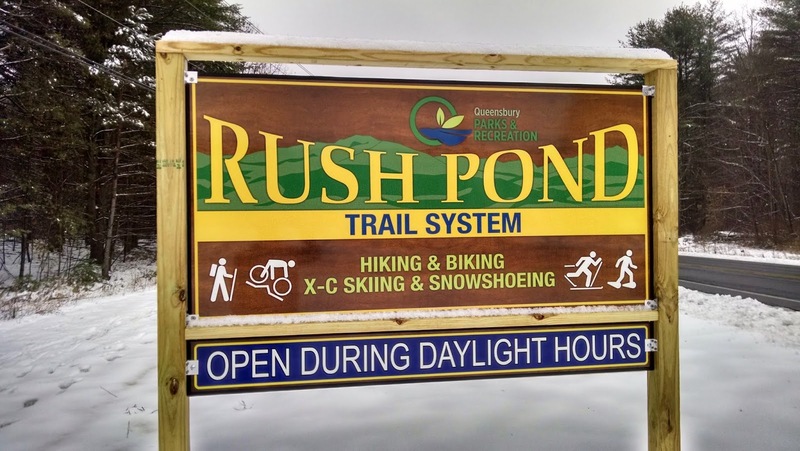 I'll still go to Rush Pond to ski the trail on weekends during daylight hours, but it would have been sooooo nice if I could also have done it on weeknights. I understand that the town is concerned about safety, and perhaps vandalism; I just wish I could find a place to take the dog at night. 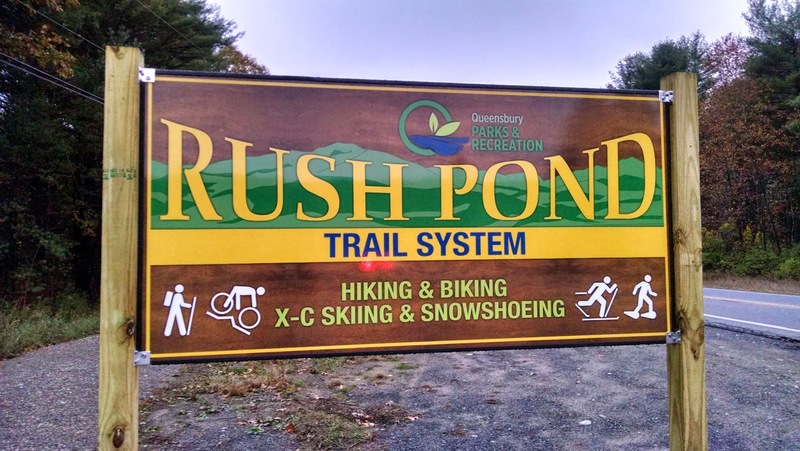 I had hoped Rush Pond was the place. In any case, it's a nice place to go. 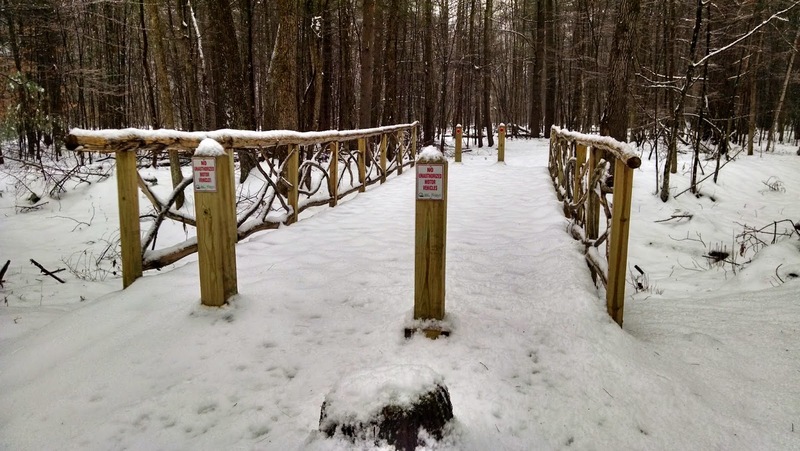 There are no trail markers yet, but the route is marked with ribbons. 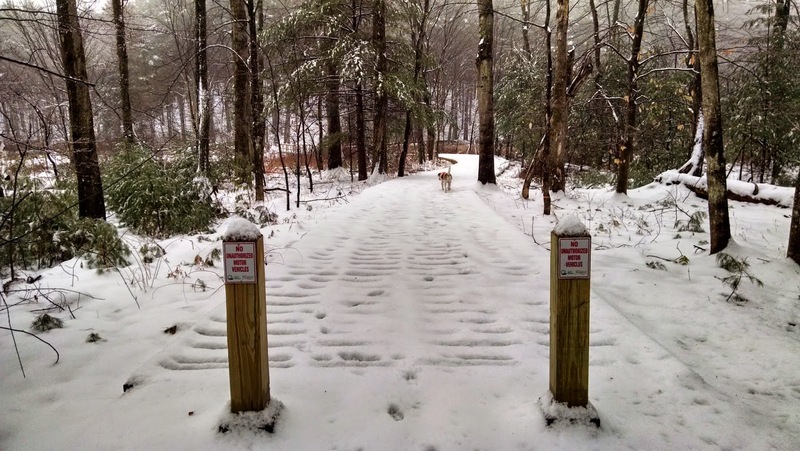 Does this trail connect with the Gurney Lane trails? Are the Gurney Lane trails also restricted to daylight hours only? Very close. You have to walk across Gurney Lane and up Carl Thomas Lane. It's just a short walk. The Gurney trails are also daylight only. I believe all the Queensbury parks are daylight only. I'm not going to break their rules. I imagine they are serious, since they posted a fine structure for violators. I may call Parks & Rec though to find out the reason, and to voice my opinion.